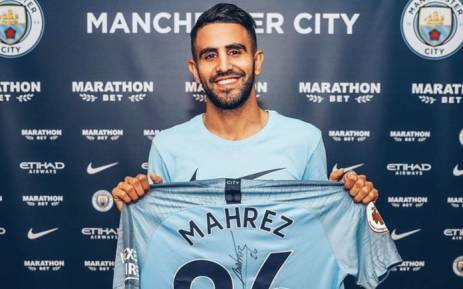 With most of the City squad still either involved with the World Cup in Russia or on extended holiday following an early exit, The Citizens broke their club record transfer fee by signing Riyad Mahrez from Leicester City for £60M, but recouped some of the outlay as Angus Gunn signed for Southampton for £10M. In addition 21 year old Dutch defender, Phillippe Sandler joined City for around £2M from PEC Zwolle and 18 year old defensive midfielder Claudio Gomes was snapped up on a free transfer from PSG. Jack Harrison after being on loan at Middlesbrough moved to Leeds on a season long loan. Pep took a very young squad with just a sprinkling of first teamers to America for the International Champions Cup tour. And a very young side lost 1-0 to Borussia Dortmund in Chicago. Then onto New York and another very young City team were narrowly beaten 2-1 by a very experienced Liverpool side. In the final tour game City beat Bayern Munich 3-2 in Miami. Pep was so happy with the way the young squad had played; “I am so satisfied for this tour and what these guys have done. It was the same in the previous two games – I said how proud I was” said the City manager. Another youngster moving on a season long loan was Tosin Adarabioyo, who would be pulling on the shirt of West Bromwich Albion for the new season. In addition to Tosin, Lukas Nmecha joined Brendan Barker on season long loans at Preston, Alex Garcia and Manu Garcia were on loans at Girona and Toulouse respectively. 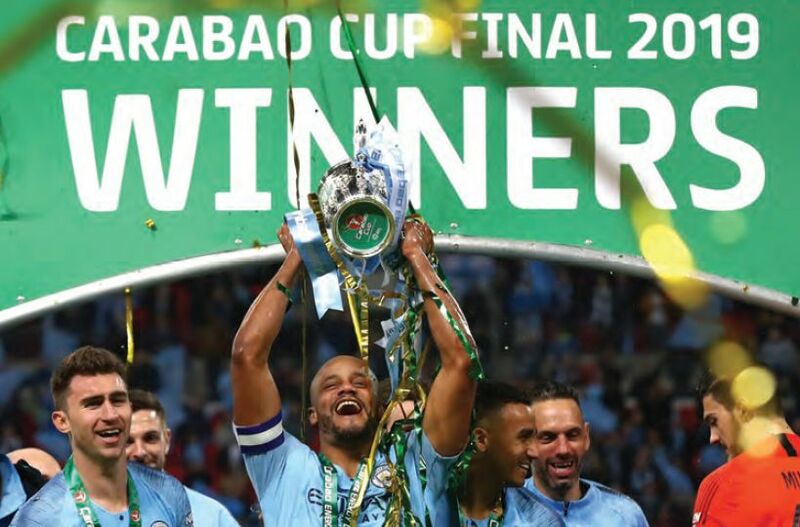 The first Silverware of the season saw City without de Bruyne, David Silva, Ederson, Kompany, Sterling and Jesus in the starting XI, dominate Chelsea at Wembley to lift The Community Shield, winning 2-0. Joe Hart finally left City on a permanent deal joining Burnley for a fee around £3.5M. And exciting youngster Daniel Arzani joined City from sister club Melbourne City and then was immediately sent to play for Celtic on a two year loan deal. 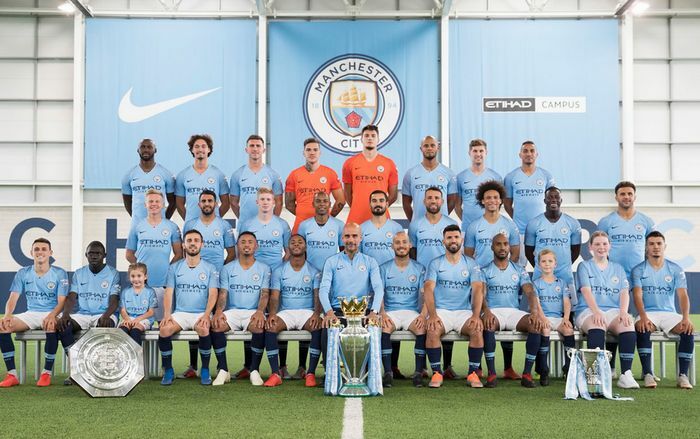 City kicked off their defence of the Premier League at Arsenal and with a starting lineup without the likes of David Silva, Kevin De Bruyne, Leroy Sane, Vincent Kompany and Gabriel Jesus, Pep’s side carried on where they left off last season with a great display to win 2-0. There was bad news before the first home game of the season as Kevin de Bruyne suffered a knee injury in training that could see him out of action for around three months. Serial loanee Patrick Roberts was sent to play for Girona for the season. The loss of de Bruyne didn’t seem to affect the team as they beat Huddersfield at The Etihad 6-1 with a scintillating display. Further training ground turmoil for Pep as City’s only senior backup keeper Claudio Bravo suffers an Achilles injury which could see him miss the whole season. 19 year old keeper Aro Muric was swiftly recalled from his loan with NAC Breda to take his place as Citys number 2 custodian. Meanwhile the City coffers were added to as Jason Denayer joined Lyon for an initial fee of around £6M. City the dropped their first points of the season as they drew 1-1 at Wolves, controversially referee Martin Atkinson and his officials failed to see Wolves goal was flicked into the net with a hand. Ilkay Gundogan commented after the game “Unfortunately the referee was probably the worst performer today, and that’s why we lost two points,”. The Blues went into the first International break with a hard fought 2-1 victory over Newcastle at The Etihad. It was service as usual in the Premier League when the players returned from their International duty as City disposed of Fulham 3-0 at The Etihad, however in the first Champions League game of the season City fell to their first defeat of the season losing 2-1 at home to Lyon. The Blues put their European setback behind them as they travelled to wales and walloped Cardiff City 5-0. City’s young England star Phil Foden then starred in a much changed side in a 3-0 victory at Oxford in the third round of the Carabao Cup. It was another clean sheet in the League as Pep’s side beat Brighton 2-0 at The Etihad, before a trip to Germany in The Champions League and a brilliant performance saw them beat a well organised Hoffenheim team 2-1. 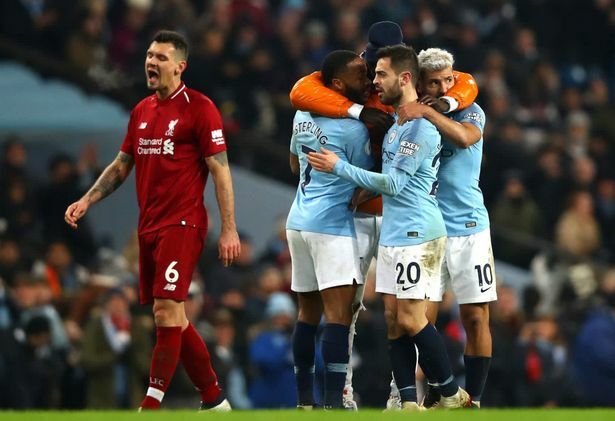 City then should have beaten their close Championship rivals at Anfield but a missed penalty and some controversial referring decisions meant they had to be satisfied with a 0-0 draw with Liverpool before another international break. The first game after the break saw an early return to the bench for Kevin de Bruyne after his injury lay off and a fifth league clean sheet on the trot as City disposed of Burnley 5-0 at the Etihad and went top of the league with rivals Liverpool and Chelsea close behind. In The Ukraine The Blues gave possibly their best Champions League performance to date as they beat Shakhtar Donetsk 3-0 to go top of Group F with three games to play. In the League City then faced a trip to Wembley, and on a dog of a pitch following an NFL fixture, they beat Tottenham 1-0. Pep gave plenty of youngsters a chance in the fourth round of the Carabao Cup, and Brahim Diaz took his chance scoring both goals in a 2-0 victory over Fulham at The Etihad. Unfortunately Kevin de Bruyne, getting a run out to get match fit, suffered a further knee ligament injury on his other leg and it looked like another six week layoff. City’s performances were getting even better and at The Etihad they blasted Southampton 6-1 then three days later scored another six beating Shakhtar Donetsk 6-0 in The Champions League, which included a hat-trick from Gabriel Jesus. Before the final international break of the year City hosted United in the Manchester Derby and blew them away in a 3-1 win which culminated with an amazing 44 pass final goal. 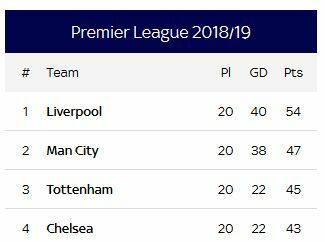 After a third of the season The Blues were top of The Premier League with 32 points, followed by Liverpool on 30 points and Chelsea on 28 points. News of further injuries meant Pep had to utilise the full squad, It was announced the Benjamin Mendy had injured his knee again in the Derby and could be out for three months in addition Bernado Silva had suffered a less serious injury on International duty. The absentees were not missed as City won 4-0 at West Ham and then they secured a place in the knock out stages of The Champions League drawing 2-2 at Lyon. The Blues remained unbeaten in the league as they beat Bournemouth 3-1 at The Etihad, however Liverpool were also still unbeaten and just two points behind City in the chase for the title. Still understrength through injury, City kept their top spot in the league with a 2-1 victory at Watford, however The Blues suffered their first league defeat of the season, losing 2-0 at Chelsea, and the injury list grew as David Silva and Fernandinho joined Aguero, de Bruyne and Mendy on the treatment table. Pep was forced to play a very understrength team for the final game in the Champions League group stages and the ‘second string’ players didn’t let him down as they beat Hoffenheim 2-1 at The Etihad to secure first place in the group. Back in the league and with Fernandinho fit and Aguero and de Bruyne back on the bench City beat a good Everton side 3-1. 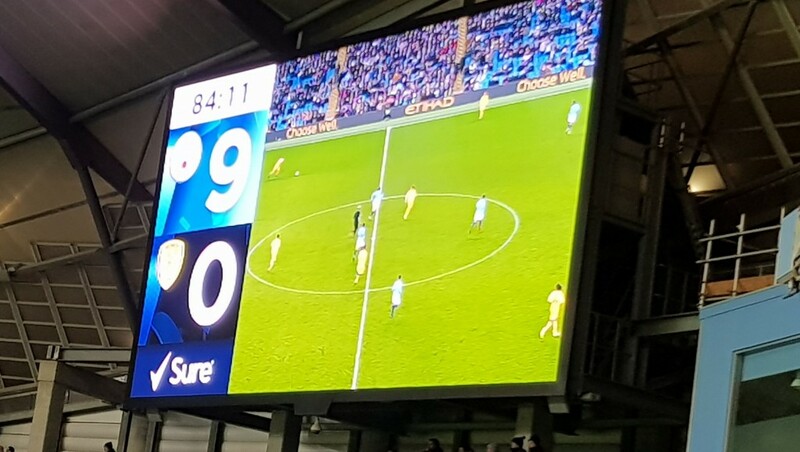 The Blues love affair with the League Cup continued as a very young side won on penalties at Leicester to move into the semi-finals of The Carabao Cup. Back in the league and things went from bad to worst, Pep was unable to name David Silva, Kevin de Bruyne, Sergio Aguero, Fernandinho or Mendy in the starting line up due to injury and fitness issues and it told as The Blues suffered their second defeat in three league games as Crystal Palace hung on to win 3-2 at the Etihad, then on Boxing Day despite the return of a half fit KDB in the starting line up City lost again, 2-1 at Leicester. Leaving them seven points behind a, still unbeaten, Liverpool. KDB picked up another knock and wasn’t available for the trip to Southampton but the irreplaceable Fernandinho was back and City put up a great display to beat Southampton 3-1 in the last game of 2018. City were now seven points adrift of leaders Liverpool and they met Klopp’s side in the first game of 2019 in a must win clash, Pep was still struggling with injuries and named half fit David Silva in the starting line up and, a less than half fit, Kevin de Bruyne could only make the bench, however the Citizens bouyed on by a fantastic atmosphere at The Etihad beat Liverpool 2-1 to cut the Scousers’ lead down to four points. A chance to rest Fernandinho and Aguero came with two amazing cup games; In the 3rd Round of the FA Cup, A strong starting eleven disposed of Championship side Rotherham 7-0 in front of a huge 52,000 fans at The Etihad, and then even better, three days later in the Carabao Cup semi-final 1st leg another strong City line up beat Burton Albion 9-0 to virtually guarantee another League Cup Wembley appearance. The transfer window was now open and Academy product Brahim Diaz, with just six months of his contract left, moved to Real Madrid for a fee of £15.5M rising to £22M and a sell on clause. Great business for the academy. Keeping the pressure on Liverpool City then beat a very good Wolves side 3-0 to stay four points behind the scousers, with David Silva making a record 267th appearance for The Blues in the Premier League. City then eased passed bottom of the table Huddersfield with a 3-0 victory at The John Smiths Stadium. The second leg of The Carabao Cup sem-final was a formality, and Pep was able to start with six academy products and still win 1-0 at Burton with Ian Povedo making his debut. The victory gave The Blues there first chance in their history to retain a major trophy. The assault on all four fronts continued with a 5-0 victory over Burnley at The Etihad in the 4th round of the FA Cup making it 28 goals scored and none conceded in the last six games. City were four points adrift of Liverpool as they travelled to relegation threatened Newcastle and against all the odds Pep’s team threw away an early lead to lose 2-1 and so with a draw for Klopps team The Scouser’s increased their lead at the top to five points. Just before transfer deadline day it was announced that another Academy player, Rabbi Matondo had joined Schalke for a fee of around £9.5M, not bad for a player had never appeared in the first team. The next week saw City’s chances of retaining The Premier League increase as they beat Arsenal 3-1 at The Etihad then midweek won 2-0 at Goodison Park against Everton, and then four days later smashed Chelsea 6-0 in Manchester, Sergio Aguero scoring his second hat-trick in three games and equalling the most hat-tricks scored in the Premier League. City were now top of the league on goal difference from Liverpool, who had a game in hand with a third of the season to go. City’s focus turned to the cup competitions, and a comfortable 4-1 victory at Newport County earned them a place in the FA Cup Quarter Finals. Then a trip to Germany, and despite two dubious VAR penalty decisions in the favour of Schalke, The Blues came away with a 3-2 victory in the first leg of The Champions League Round of 16. 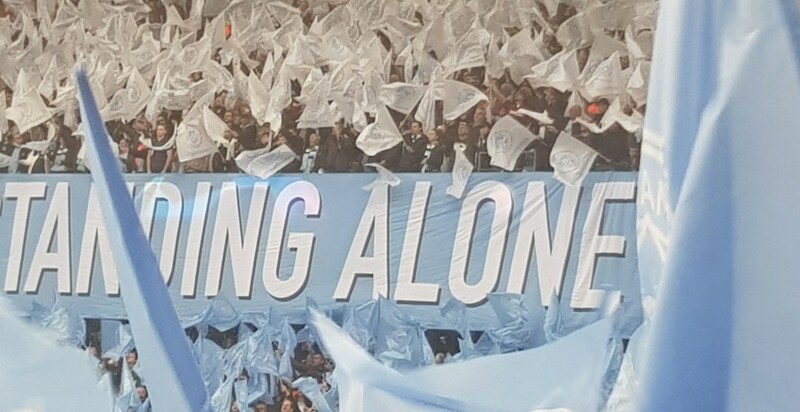 Then it was a trip to Wembley and the chance to make City history by retaining a trophy for the first time, It was a tight Carabao Cup Final against Chelsea and after extra time the result was 0-0, however Pep’s side kept their nerve in the penalty shootout winning 4-3 to lift the first trophy of the season. The downside was that Fernandinho suffered a groin injury that could see him missing for around six weeks, and with Aymeric Laporte also on the injury list it was a concern with matches coming thick and fast. In the league Liverpool had dropped two points at Old Trafford the day City lifted the cup and so City were now just one point behind the Scousers. The Blues then beat West Ham 1-0 at The Etihad, and Bournemouth 1-0 at The Vitality Stadium to keep the pressure on Liverpool, however the injury list grew longer as both John Stones and Kevin de Bruyne left the field with what looked like muscle injury’s. The Blues kept up the pressure on Liverpool in the league with an impressive 3-1 victory against Watford at the Etihad. Then before the International break there were two important cup games, first up was the 2nd leg in the Champions League against Schalke and an incredible 7-0 win for City saw them easily into the Quarter Finals, then, in what looked to be an easy FA Cup Quarter Final at Swansea, Pep’s side were 2-0 with 20 minutes to play but showed why they were favourites to lift the cup by coming back to win 3-2. The internaional break enabled Kevin de Bruyne time to come back from his latest injury setback in a great performance at Craven Cottage where City beat Fulham 2-0 and then a further 2-0 victory against Cardiff to keep the one point advantage over Liverpool at the top of the table. 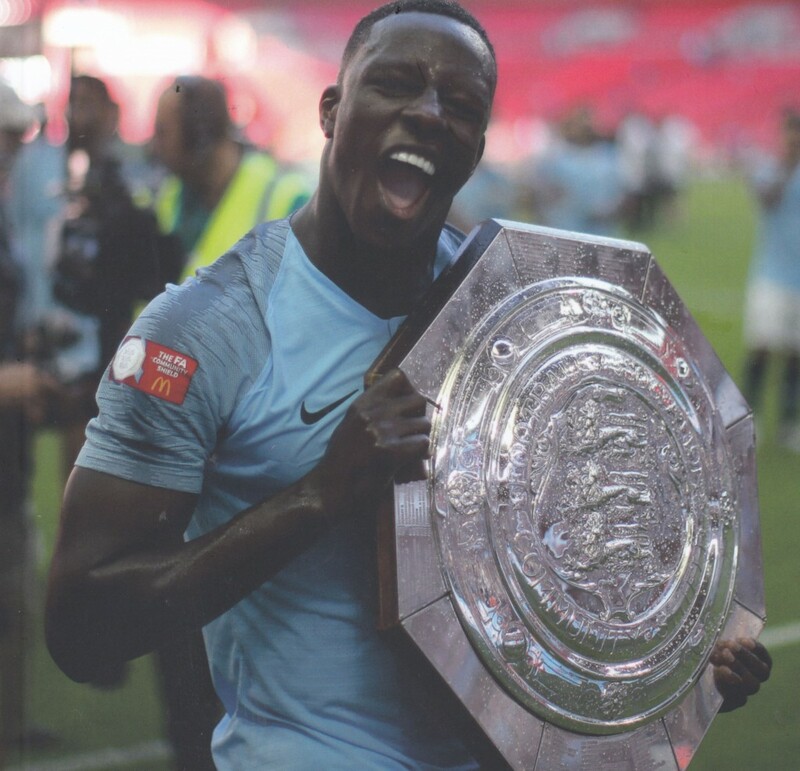 Another Wembley visit and Pep’s side kept the ‘impossible’ quadruple dream alive as they beat Brighton 1-0 in the semi-final of the FA Cup, which also saw the return of Benjamin Mendy from his long term injury set back. The pressure was on but in the league City made it eight wins on the trot, beating Crystal Palace 3-1 at Selhurst Park. The quadruple was then put to rest as City failed to get past the Quarter Final stage, in a match at The Etihad that Gary Linekar commented “one of the greatest, most enthralling, dramatic and emotional games of football I’ve ever been at”. City won 4-3 having a last minute goal ruled out by VAR but were out on away goals.